Our organization provides a wide range of Shoe Laces to our clients. These laces are acknowledged worldwide owing to their attributes like premium standard and superior finish. 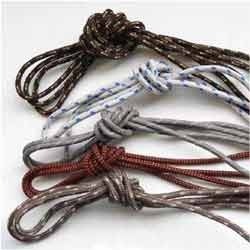 Our range of these shoe laces are available with crimp ends, varied patterns and designs, and are suitable for various slip-on shoes, which are used for Triathlons, Playing Sports and Casual Wears. We hold expertise in providing a qualitative range of Formal Shoe Laces to our clients. These are manufactured using highly advanced and well equipped machines. These shoelaces are strong and durable and are resistant to fraying as their edges are securely contained in plastic edges. These laces offered by us are sure to add a grace to the personality of the wearer. Customers can purchase these products from us at market leading prices. 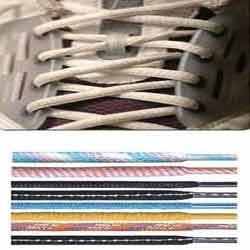 Our organization is engaged in offering a superior range of Sport Shoe Laces to our clients. These are manufactured using premium quality raw material and fulfill with the international quality standards. These sports shoes laces are widely appreciated by the customers based across the nation for attributes like perfect finish, excellent finish and color fastness. They can be customized as per the requirement of our customers. With the help of our experts, we offer a wide range of Shoe Laces that are highly appreciated for their features like premium standard and superior finish. Our ranges of these can be used for different types of shoes. They are available with crimp ends, varied patterns and designs. These laces are available in different thicknesses, widths and sizes to cater to the requirements of clients and can be customized as per the requirement of our customers. We supply these at market leading prices. 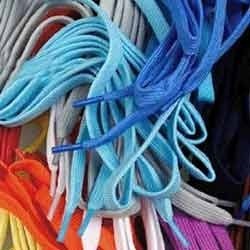 Our organization offers a superior range of synthetic shoe laces to our clients at industry leading prices. These are fabricated using premium quality raw materials, which are sourced from certified vendors in the market. Our range is highly appreciated by our clients for the high finishing, quality and user friendly nature.